Like its sibling, the Braaap, the Mullet took it’s the hull shape from modern slalom boat design. 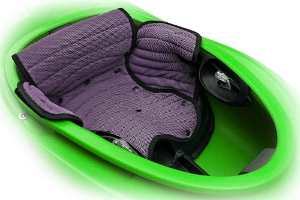 The rocker starts just behind the seat and lets the Mullet tilt back for quick pivots and snap carving turns into eddies. But don’t think the Mullet is just an XL Braaap as though the DNA is obviously shared, a close look will show up plenty of differences. Volume might be similar on the page but in the plastic it’s easy to see the Mullet has a much more asymmetric distribution with a large big flat bow allowing easy enders whilst playing and resurfacing when running rivers. The stern is full on slalom style with scooped rails for engaging eddy lines and even catching waves. The mullet keeps the length of the Braaap for speed but is over 2” wider giving a more stable feel and helping those bigger lads park their feet in comfort. To summarise, as Liquid Logic clearly state on the boat, the front is all business and gets the job done in an efficient manner which lets the stern party all the way down the river! We offer a delivery service for the Liquid Logic Mullet to home and work addresses throughout England, Wales, Scotland, Northern Ireland & Ireland. Buy a Liquid Logic Mullet online from our website and collect from our store in Newhaven, East Sussex or from any branch within the Canoe Shops Group. There is no cost associated with this*.